On the fifth anniversary of UCF’s campaign to become a smoke-free campus, the university’s smoke-free committee says positive strides have been made toward the goal – but there’s still work to do to encourage more faculty, staff and students to quit the habit. Because every semester there are new people on campus, there needs to be constant emphasis not only on the policy but the ‘why’ behind the policy, said Dr. Mary Schmidt-Owens, associate director of Student Health Services and co-chair of the campus smoke-free committee. “Why did UCF initiate this policy? Because smoking remains the No. 1 reversible health behavior. Because statistics show that the majority of smokers pick up the habit before the age of 25, and by reducing the visibility of smokers, persons are less likely to pick up and start the habit,” she said. The National College Health Assessment each year asks a sample of students about health behaviors. Their numbers show that the “everyday use of cigarettes” among UCF students has dropped from 3.6 percent in 2011, to 1.1 percent in 2016. In addition, student support for the campaign increased from 88 percent to 93 percent. The UCF smoke-free committee – which includes representatives of student, faculty and various departments across the campus – recently undertook its own survey of observed smokers on campus and found that most said they were aware of the smoke-free policy. A significant number of them, however, were interested in help with smoking cessation, said Dr. Michael Deichen, executive director of Student Health Services and co-chair of the committee. The smoke-free campaign was set into motion in fall 2012 in support of providing clean air for all. UCF community members are encouraged to explain the policy when encountering someone smoking and ask them to put out their cigarettes and e-cigarettes, which also are covered by the policy. “There has been an uptick in the number of e-cigarette users and we are making an effort to communicate the harmful effects of this smoking device,” Schmidt-Owens said. To help push the smoke-free campaign, the university will participate Nov. 16 in the American Cancer Society’s annual Great American Smokeout event, when smokers around the country are asked to make the pledge to quit. Members of the Student Health Advisory Committee and Student Government Association will be on the Student Union patio 10 a.m. to 2 p.m. to provide support to those taking a pledge to quit smoking. Visitors can write notes to post answering the questions: “Why you want to quit smoking?” or “Why you support someone to quit smoking.” There also will be a poster for anyone who has quit smoking to write their names so their success can be celebrated by the UCF community. 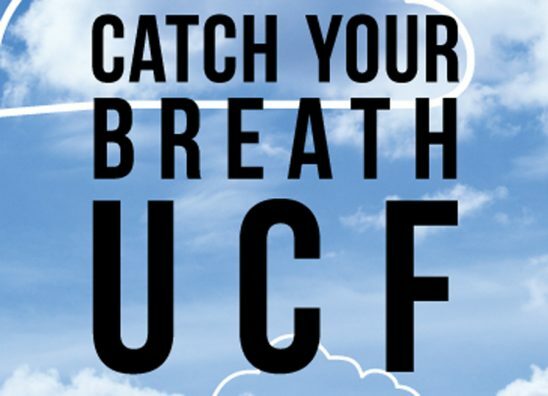 The Student Health Advisory Committee will set up a Catch Your Breath UCF tent 10 a.m. to 2 p.m. outside the Business Administration I and Engineering I buildings to promote and educate on the policy. They will conduct a survey and give T-shirts to participants as long as supplies last. A smoking-cessation orientation will be offered 2-3 p.m. in Global UCF Room 122. Led by Schmidt-Owens, this is an introduction to the resources at UCF available to help smokers quit. It is open to anyone who has ever considered quitting and would like information and resources. The smoke-free policy applies to employees, students, visitors, vendors and others on university-owned or leased properties. The initiative was started by President John C. Hitt to encourage healthy lifestyles and change the community’s behavior so that everyone’s right to clean air is respected. Campus groups including the Faculty Senate, USPS Staff Council, SGA, Greek Council, and Fraternity and Sorority Life endorsed the action. Today there are about 1,760 smoke-free college and university campuses around the country, according to the National Tobacco-Free Campus Initiative. UCF outlines the policy at orientations for students, faculty and staff. The university provides smoking-cessation services and resources – including individual and group classes, support groups, counseling, self-help materials and medications – to employees and students who want to quit. The campaign also is embarking on more-visible no-smoking reminders on signs, brochures, tailgating reservations and other events to raise awareness. For details about the policy, smoking-cessation classes and other information about the smoke-free campaign, go to http://www.ucf.edu/smokefree.